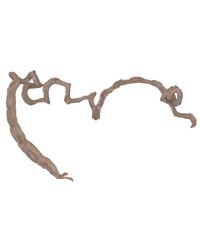 Amazon lianas can reach lengths of several meters and vary between 2-3 cm and 10 cm in diameter. They are light and have several hollows which are excellent water containers or planters. These lianas usually have lots of turns and bends and tend to look like a corkscrew. Lucky Reptile Amazon Lianas are excellent for tropical terrariums and provide the animals with hiding and climbing places.